MOSCOW, July 24. /TASS/. 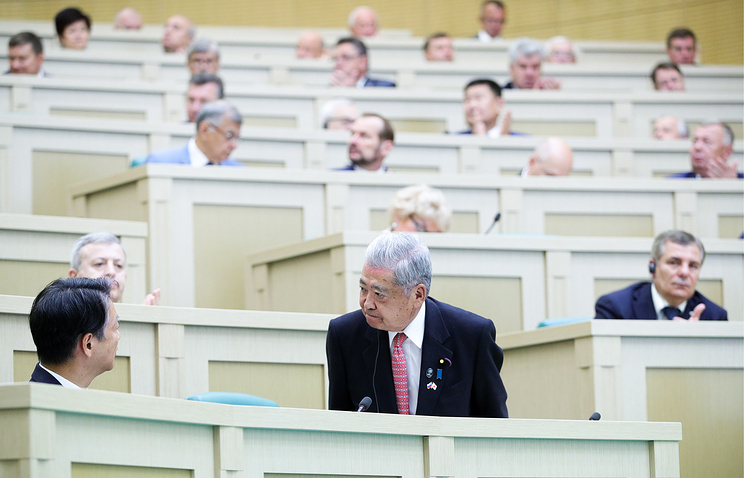 President of the Japanese House of Councilors (upper house of parliament) Chuichi Date has warned against shifting the signing of a peace treaty between Tokyo and Moscow to the next generations’ shoulders. Speaking at a plenary session of Russia’s Federation Council, the upper house of parliament, on Tuesday Date said: "Since the end of World War II there has been an abnormal situation between our countries - the lack of a peace treaty." "This is very sad. We are obliged to make every effort to end challenging problems between Japan and Russia, sign a peace treaty and give a greater impetus to the potential of bilateral relations," the politician said. "I believe as people, who are directly related to politics, we should try to solve this problem when we are alive rather than shift this to the shoulders of our next generations," he stressed.